These solutions could completely replace your current technology, but they’re more likely to run alongside existing systems. Cloud-based solutions let you pick upgrades you need without the expense of replacing all your current equipment right away. Plus, your customers can start using the channels they love, giving an instant boost to loyalty and retention. Cloud-based contact center solutions not only create enjoyable experiences for customers. They also give you tools to raise agents’ and managers’ productivity and job satisfaction while lowering attrition and training costs. Customer service used to be black and white. A customer called and waited for an agent to answer. But call volume rises every year, even as people reach out via text, email, web chat and social media. They want to interact with you at a time that’s convenient for them. Waiting on hold is not convenient, and it causes stress for your agents. Integrating automated solutions, like an IVR or one-way and two-way proactive text messages, is option to increase self-service and answer questions before someone calls. Other tools, like SMS Assistant, help agents interact more efficiently, creating exceptional experiences for everyone involved. Best Practice #2: Support popular channels customers want with solutions that make agents’ jobs easier. Modern contact centers are gaining momentum as the best option for responding to customer needs — regardless of channel or device. Good cloud-based solutions integrate customer data across all channels, letting employees see someone’s interaction history to relieve frustration for both your customers and your agents. One of these tips already told you to keep an eye to the future, but this goes one step further. Not only does your contact center technology need to be ready to adapt, you must put a strategy in place to incorporate new channels as they develop. Crafting that strategy can be a major challenge, but your communication technology provider may be able to help. When it comes to contact center providers, you have two options. Some providers sell a Software as a Service (SaaS) model, in which you’re on your own to implement, strategize and upgrade your solution down the road. Managed service providers, on the other hand, take that responsibility and emphasize service in addition to software. A partner with managed services supplies experienced contact center professionals who work with you throughout the life of a contract to ensure you’re providing the best customer experience possible. These are the partners who go beyond software and employ professional services expertise to help you devise the right strategy. Best Practice #3: Don’t hire a software provider. Work with a partner who will keep your contact center ahead of the curve. With the right partner, you can leave strategy in the hands of experts, so you can focus on present-day operations of your business. Before simply buying the newest headsets or routing system, go through these three best practices to discover what you really need in a cloud contact center solution. 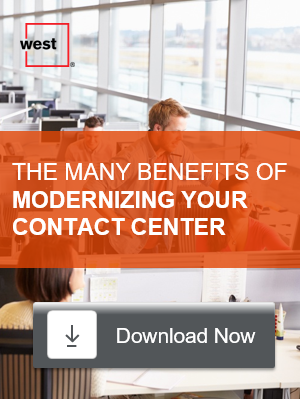 You can read even more about this process by downloading our ebook, The Many Benefits of Modernizing Your Contact Center. If it’s time to upgrade your contact center, don’t worry. Follow these few best practices to get the updates you need and prepare for new changes to create the most benefit for your customers, your agents and your business. With the right partner and strategy, contact center modernization can ensure your customer service never goes out of style. Interested in finding out more about the topics in this blog or West? West is one of the subject matter experts that will be sharing their insights and expertise at Customer Response Summit Charleston, March 12-14, 2018. CR Summit Charleston will feature speakers from Neiman Marcus, Indeed, Capital One, T-Mobile, and more. For more information about our leading event for CX professionals, visit our event website.